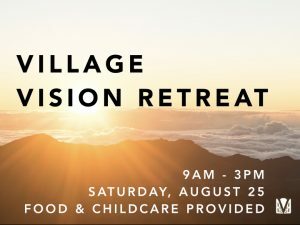 If you are a Partner or Leader at the Village Church, you are warmly invited to our annual Vision Retreat! The Vision Retreat is a day when the people of The Village hear from God as we gather with one another in preparation for His work in our church. Retreat will take place at the church building. Light breakfast, snacks, and lunch provided. Note: This year’s Vision Retreat will also serve as our Partners’ Meeting for the fall, so please plan to participate.